On the surface, the classic San Francisco residence doesn’t seem to offer much scope for enhancement. The city is justly famed for its Victorian-era residential architecture, creating neighbourhoods full of characterful, beautifully crafted façades that give the city an intimate, human scale. It’s also renowned for some of the US’ most stratospheric real estate prices, buoyed by the bottomless coffers of start-up funding and ruthless competition for the best tech talent. As a family with a long-standing connection to the neighbourhood, yet a desire for a modern living space, radical change was the best approach. Jensen Architects were commissioned to transform the 4,200 sq ft space into a truly modern home. The house was originally designed in 1889, and that ornate wooden facade has been lovingly restored. Although not quite on the level of scale and intricacy of the celebrated terrace of ’painted ladies’ located nearby, the original facade conceals an entirely new structure, a layered composition of glass and aluminium that maximises the building envelope. Working with San Francisco-based Drömhus General Contractors, Jensen and his team have used the generous Victorian proportions to the full, and the radical overhaul includes a light filled open-plan third floor set above six bedrooms and utility spaces on the first and second floor and a basement apartment. The house is topped off with a terrace to get the most of those topographically-enhanced views, while the whole ensemble is unified by a remarkable wooden staircase, which zig-zags up through the interior creating a solid sculptural presence that is the heart of the house. Elsewhere, laser-cut aluminium screens filter light from the multi-aspect views, with motorised panels to create privacy as and when it’s needed. White oak, marble and muted colours, including fireplace tiles that evoke – in material, if not in form – the original materials of these Victorian-era survivors complete the materials palette, while roof-lights and glass floor panels enhance the verticality of the living space. 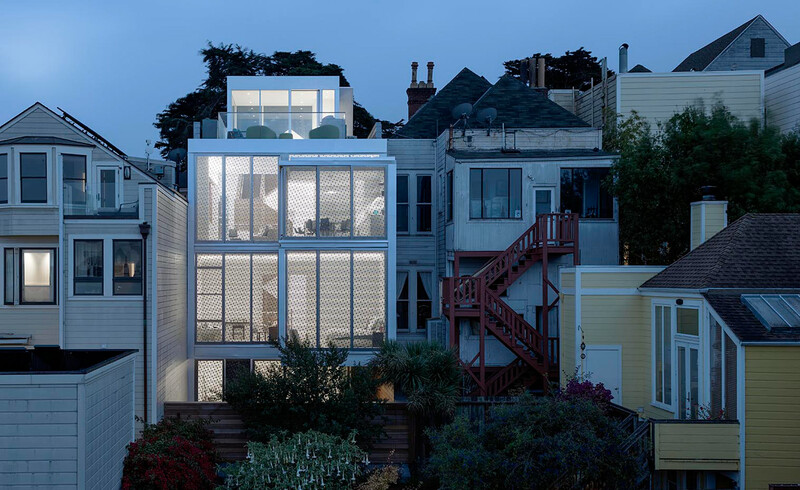 The house fronts onto the landmark Alamo Square Park and the house was once owned by a prominent local conservationist, a fitting connection for a project that brings contemporary design and craft into a restored and enhanced shell.